You may have been wondering why the lack of new shiny in my Etsy shop, or general lack of new posts on my Facebook page. (Or maybe not!) 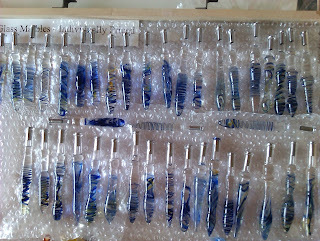 Well, I've been making pens, lots of pens, lots and lots and lots of them. Endlessly. For weeks. And you can't have any of them! It's come at an ideal time for me, a few months before I start gearing up for Expos in October and November, plus all the craziness that happens at the end of the year! However I have had to put all the other projects and sculptural stuff on hold, as well as not having much time to blog, or make extra things to list on Etsy. Even my Greenwich stall is starting to look a little empty. A few pens, and still a lot more to make! In a way it's been quite nice not to have to think too much about what to make next during my days in the workshop. Instead of, 'do I make a pendant, and what sort, or a marble?' it's 'what to make next? Another pen! And then another!' I must admit around numbers 48 to 54 I did start getting a bit fed up of making pens, however once I got into the sixties I got back on a roll again. They are now nearly finished, and hopefully by the end of this week or start of next week I'll have them all finished and delivered (crossing my fingers and toes that the client likes them!) After that I'll get back to some normality and start making lots of new pendants and marbles for the Etsy shop and the upcoming Expos, hopefully including a few new exciting things too! 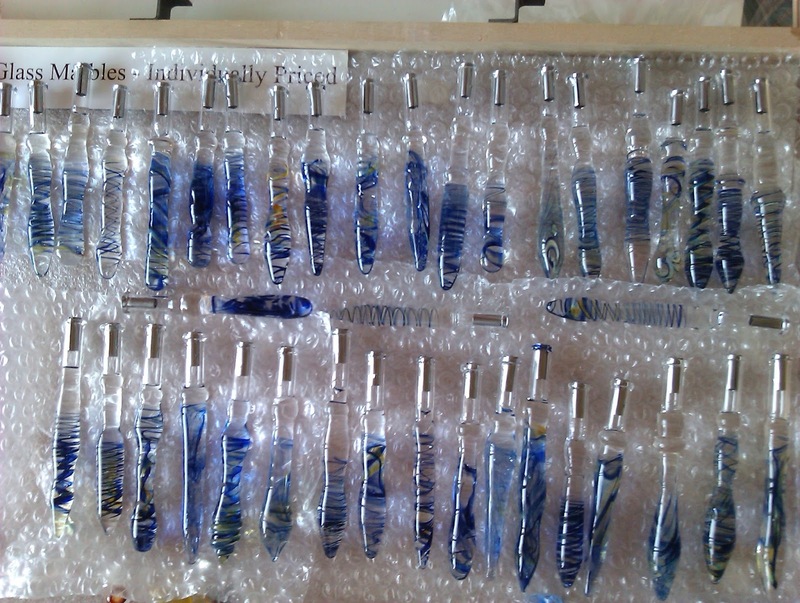 The pens are finished - and off to amazing desks!